From API, is a complete input module with mic pre, dynamics processing, precision EQ and output level control. With extensive signal metering, multiple balanced insert points and an output mute switch, The Channel Strip contains the best features of a large console input channel in a single rack space. It's the perfect choice for anyone looking for that high-performance API console sound. Complete patching facilities on rear panel. Two ten segment LED VU displays. The result of thoughtful engineering, The Channel Strip includes everything needed to record an audio signal. It all starts with the famed 512c Mic Preamplifier, which includes the benefit of additional Mic, Line or Instrument input switching. Next is the 527 multi-mode Compressor with fully adjustable Threshold, Attack, Release, and Ratio controls on detented pots. The patented THRUST® circuit in the 527 gives your track the "in-your-face" punch that has made this circuit an award winner. Also included in The Channel Strip is probably the most recognized and revered API EQ of all time, the 550A three-band Equalizer with its switchable frequencies and 12dB of boost or cut. The 550A's High and Low frequency bands can be individually switched to be shelving EQs, and the B. Filter switch inserts a 50Hz to 15KHz bandpass filter. At the output of the unit is the 325 Line Driver, taken directly from API console designs with an output level pot and 10 segment meter. The meter can also be switched to show the output level of the preamp. Each of The Channel Strip's processing pieces can be switched in or bypassed individually, while a flip switch internally routes the compressor after the EQ if desired. Additional features include a side-chain input and the famous API 2520/transformer combination. Should a problem ever arise, our team will go above and beyond to facilitate your gear's repair or replacement. We think that having an unexpected gear problem is headache enough, so we take care of every detail to get you and your gear back up and running as fast as possible. When you choose Vintage King, you're automatically covered. Call 1.888.653.1184, and press 2. If outside the United States please call 1.248.591.9276. Please be aware that pro audio is susceptible to damage during transit. Be sure to retain the original packing materials, original receipt and all merchandise tags for any item that you wish to return to us. If an item arrives damaged, make certain you examine all boxes before acceptance. The delivering agent MUST note damage to any cartons on the release form or refuse acceptance. To learn how to become verified. To reserve your right to return the gear within 30 days, please observe these steps upon receipt of item(s). Keep all packaging in like-new condition. Open packaging gently and carefully. Use a razor blade or scissors to carefully open any sealed packaging. Take note of how components are packed. Keep all items in new condition unless 100% sure you're keeping the gear. We recommend rack mounting only after you're certain you're keeping the gear. If rack mounting, use plastic washers and beware of metal rack screws' tendency to scratch rack-mount holes. Contact Vintage King to obtain a Return Authorization (RA). Place a copy of the RA inside the package of the items for return. Write RA number anywhere on your airbill, not on the box or packaging. Remember you own it until we receive it. Products like software, computers, computer hardware, hard drives, tape, ribbon mics, personal items (such as headphones, etc), oversize or overweight items, and special order items are not returnable. We will inspect your return once it's received. All costs are the sole responsibility of the customer. Non-Refundable Items While most items are available for return, the following items are excluded. Personal items (earphones, headphones, windscreens, pop-filters etc). CHOICE OF LAW This Agreement has been executed and delivered in the State of Michigan and shall be governed by and construed and enforced in accordance with the laws of the State of Michigan. 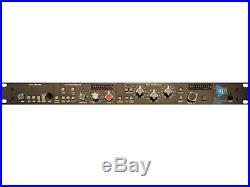 The item "API The Channel Strip 512c Mic Pre, 550a EQ, 527 Compressor, 325 Line Amp" is in sale since Thursday, July 13, 2017. This item is in the category "Musical Instruments & Gear\Pro Audio Equipment\Preamps & Channel Strips". The seller is "vintagekingaudio" and is located in Ferndale, Michigan. This item can be shipped worldwide.